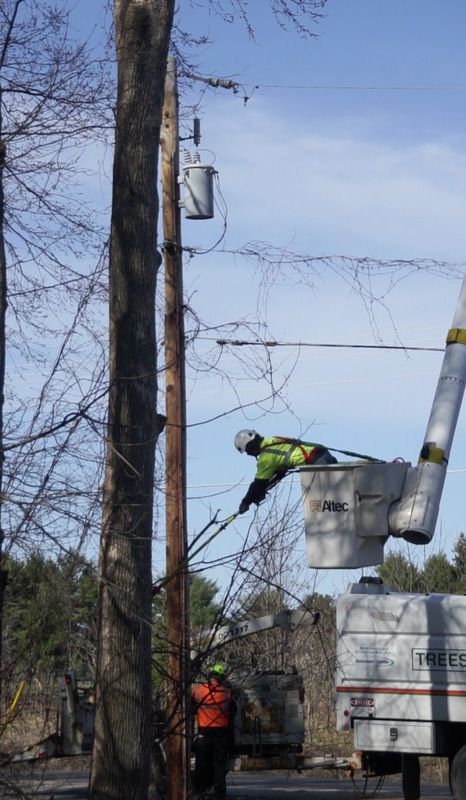 Two years ago we were notified that some trees were going to cut down because of concerns with the power lines. The crew arrived Thursday morning (yes we got a touch of snow the night before) mother nature pranking us once again! They trimmed up the smaller branches. For some reason they pulled off the job, tidied up the yard and left early that afternoon. The day before I let them know I had a little honeysuckle bush right next to it and I'd appreciate it if they didn't demolish it. He accommodated me by making sure the wood fell to the opposite site. Trimming off lower branches before he parked the bucket and came down. I clicked away and caught it mid-air. When it dropped the earth shook! It's exciting to witness and feel the impact and it makes you realize just how much weight there is in a tree. I'm sure glad they know what they are doing because that fell in line with to the corner of the living room! We did note last year that it barely had leaves on it so it was on it's way out but it's very sad to see such a big tree have to be taken down (just glad I didn't have to pay for it). You can just barely make out the honeysuckle next to the stump. Doesn't look like much now but once things green up it will be pretty again! This is the honeysuckle bush I asked them to be careful of. I'm grateful I was here to be able to ask them because I'm sure with it's close proximity it would have been a goner. I darn near killed this honeysuckle once before by transplanting it at the wrong time. It took two years for it to start making a comeback but now it's recovered nicely and I hated to think I'd loose it. They rolled the pieces over by the woods. A friend of ours will be coming by to take the wood away since he uses it to heat his home. Quietly at peace- only the sawdust of it's shadow remains…. Well, here you are! OH my heavens, that is a huge tree! Happy for the honeysuckle save!! Yay!! So nice of them to hear you concern for the Honeysuckle. Can't wait to see all your Hosta's come back they are my favorite. you have so many different varieties love them all. Hi Liz, WOW what a big tree to come down. You captured the process with some great shots. So glad they saved your honeysuckle. Your garden will be gorgeous again this year and I look forward to seeing it. My Hostas are all up and full and I look at them and think, do they look as pretty as Liz's?? I signed up to follow this blog -- I always look forward to your posts on the other side of the lane. Doesn't it feel as though it will never be full-out spring? You were lucky to get this tree removed before it did some real damage to your property and very lucky that the gentleman doing the work was so conscientious as to make sure your honeysuckle was not damaged during the process. We had to have three large old pin oaks removed from around our old house. All were within ten feet of the house and had problems with carpenter ants, one had split and dropped a large branch through the garage roof. Your back yard reminds me of my yard at my old house. I loved the trees and it hurt (financially and aesthetically) to have to take such drastic steps to prevent future damage to my home. Tree trimming/removal is always exciting...and expensive. It's good that your utility company did it. Wish they'd do some at our house. They trim, once every few years on the side of the street that has the power lines, but not on our side, unless there is a problem. It's nice that they left the wood for your friend, too. It is exciting to watch professional tree trimmer. They did a great job - it amazes me they can get those big trees to fall just where they want them to. It's been awhile since I've visited this blog so I've signed up for it . Love reading about your beautiful gardens! It gives a pang to witness the death of giant but indeed is too close to the lines and if she was dying one of those blasted winters would make too much damage, I think. I'm looking forward to Spring to arrive and stay in your neck of the woods and see all those plants and flowers bursting with happy colors and scents. It's always amazing how much work is necessary to get one tree down. Glad that your honeysuckle was spared! Hope that the weather continues to warm up. I can't believe that you had snow just last week! Liz, it's always sad to see trees being cut down or ones that have fallen due to ice storms or other catastrophic incident. So glad you were able to save that pretty honeysuckle bush! Poor thing has had some close calls, huh?